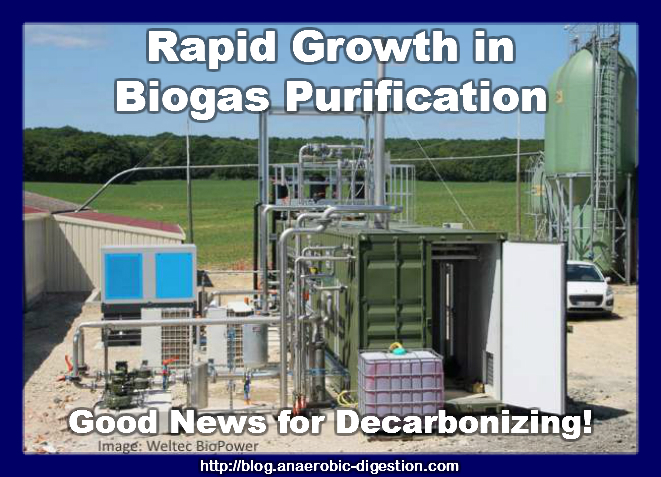 There is a biomethane biogas purification explosion taking place. The rapid growth in biogas purification is a development which will help nations to de-carbonize their energy use, especially in transport fuel, and it is a very welcome recent phenomenon. At this blog we have often said that anaerobic digestion has great potential, but until 2 to 3 years ago producing biogas was almost always as far as AD Plant developers went. That was because, to gain funding assistance from the big financial institutions was difficult for anything beyond basic commercial AD Plants coupled to a gas-engine to generate electricity. That meant that anaerobic digestion plants would only be financially funded by the banks where local power companies would first of all be willing to pay for the electricity, and furthermore, pay a higher than normal “Feed-in-tariff”. And, second where the AD Plant was close enough to the 11 Kv power lines to be able to connect to them at a reasonable cost. 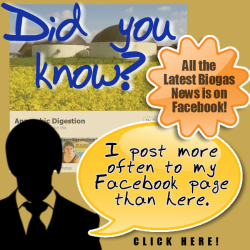 Many potential biogas plants were as a result not viable. Many farms, and businesses were fortunate enough to have a willing local power company to accept their biogas created electricity at a reasonably high payment rate (usually higher than for fossil fuel derived power) or, are simply too far from a grid connection for connection to be affordable. That is all changing now and there is a rapid rise in “biomethane” upgraded biogas plants, and in the UK Gas Plasma Systems that produce methane rich process gas, now entering construction. This is very positive news for the renewable energy industry globally. The biogas purifying equipment being used is not cheap, but it opens opens up the biogas industry to a huge market. Once an AD plant has been enhanced to produce biomethane a huge market comes available for bottled biomethane gas, or gas injection into the regional gas grid. With the increasing demand for “natural” gas these days, and for clean fuel for transport fleets, the demand for the “biomethane” produced must be almost insatiable. Biomethane is a product that truly sells itself! On 5 August, the “Longchamps? biomethane plant in the Franche-Comte region in eastern France went live. Thus, 70 standard m3/h are now continually supplied to the natural gas grid of the French gas distributor GrDF (Gaz re´seau Distribution France). Plant operator David Peterschmitt uses about 6,000 t of agricultural leftovers a year for the production of biogas from anaerobic digestion. 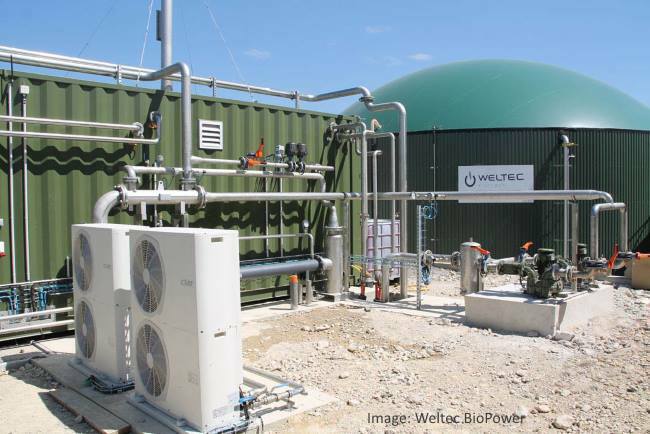 To ensure effective biogas processing, German plant manufacturer WELTEC BIOPOWER decided to deploy flexible, compact membrane technology. In the three-stage separation procedure, methane is separated from carbon dioxide (CO2), water vapour and other components with the help of special polymer membranes. The WELTEC membrane procedure is highly efficient and delivers a methane yield of about 99 percent. To optimise the plant synchronisation, WELTEC integrated the custom-developed LoMOS SPS control. One of the special features of this system is an SQL database-based task management: The user merely needs to enter his individual tasks for the biogas plant in the user-friendly calendar, after which the LoMOS control automatically executes the entries. 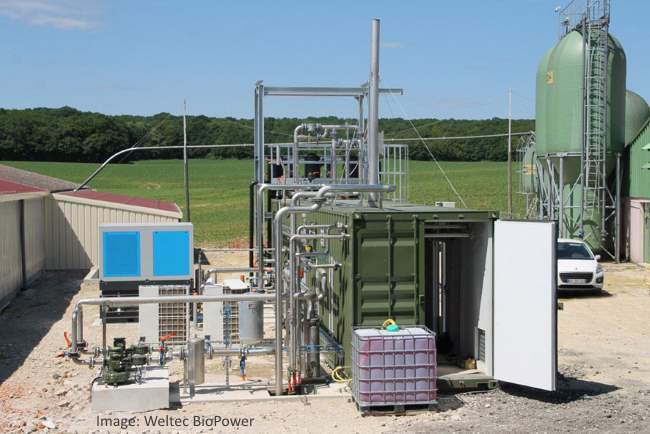 In view of the user-friendly operation and high-quality components, the builder and operator David Peterschmitt is very optimistic: ” – I am convinced that the technologies employed by WELTEC BIOPOWER will ensure optimum efficiency as well as permanently stable, economic operation of my biomethane plant.? All this amounts to a biomethane “explosion”!, a huge growth in pure methane fuel production using the greenest possible technology of Anaerobic digestion. This is the next stage of biogas adoption. Purified biogas is just the same as “natural gas”, so the market for biomethane is as huge as for natural gas, but even larger because biomethane is properly “green” (renewable) and natural gas only “green” when compared with coal use. I am looking for a financial template. I wish to use one such to calculate my payback for biogas upgrading my AD system. Where can this be found?